A 46-year-old man of Ethiopian origin was admitted to hospital in 2008 for investigation of cough, increasing dyspnoea and weight loss over several weeks. He was known to be HIV positive. He had a history of several opportunistic infections, including Cryptosporidium diarrhoea, tuberculosis, Mycobacterium avium complex and Pseudomonas pneumonia. He had also been treated in 2005 for visceral leishmaniasis with liposomal amphotericin. His prescribed medication included trimethoprim–suxamethoxazole, clarithromycin, efarinez, lamivudine, zidovudine and folic acid. His compliance with highly active antiretroviral therapy (HAART) was known to be poor. On physical examination he was afebrile. Aside from moderate tachypnoea (24 respirations/min), his vital signs were normal. General examination showed cachexia and marked parotid swelling. The abdomen was non-tender with hepatosplenomegaly. Cardiac/respiratory examination was normal. Laboratory testing revealed a normal haemoglobin level (14.4 g/dl), leucopenia (total white cell count 1.46×109/l; neutrophils 1.0×109/l, lymphocytes 0.3×109/l, eosinophils 0.1×109/l) and thrombocytopenia (113×1012/l). CD4 count was 34×106 cells/l. Other blood tests were within the normal range, except for hypoalbuminaemia and elevated liver enzymes in a cholestatic pattern. On admission to our institution, the chest radiograph showed diffuse bilateral airspace opacities mainly in the left upper and right lower lobes (Supplementary fig 1 online). CT scan of the thorax performed elsewhere 1 month prior to his admission showed peripheral pulmonary consolidation throughout the left lung and bilateral areas of ground-glass opacities (Supplementary fig 2). Massive hepatosplenomegaly was noted (Supplementary fig 3). A transbronchial biopsy was performed (figs 1 and 2). 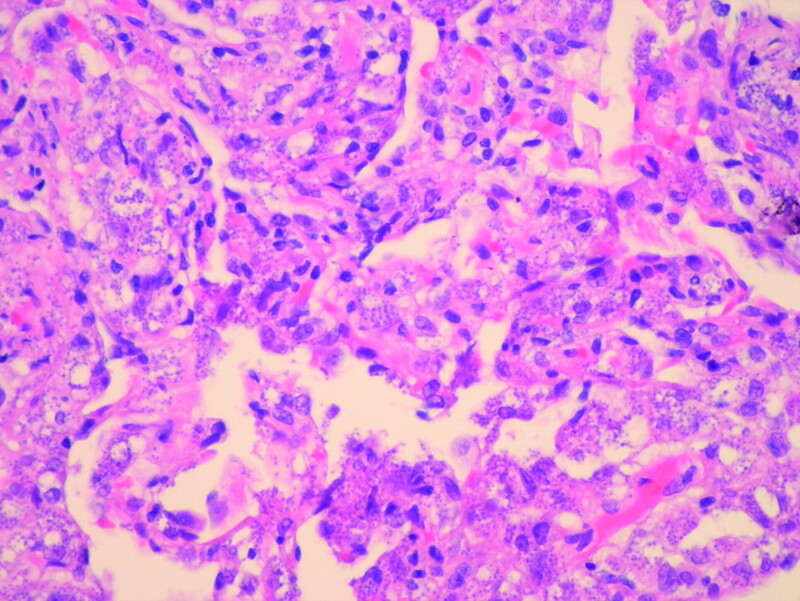 Transbronchial biopsy: the lung parenchyma is heavily infiltrated with mononuclear cells containing a large number of small purple/blue staining structures (H&E stain ×40 magnification). Transbronchial biopsy: as fig 1, but at higher magnification (H&E stain ×100 magnification with oil immersion). The transbronchial biopsy showed large numbers of mononuclear cells in both bronchial and parenchymal tissue. 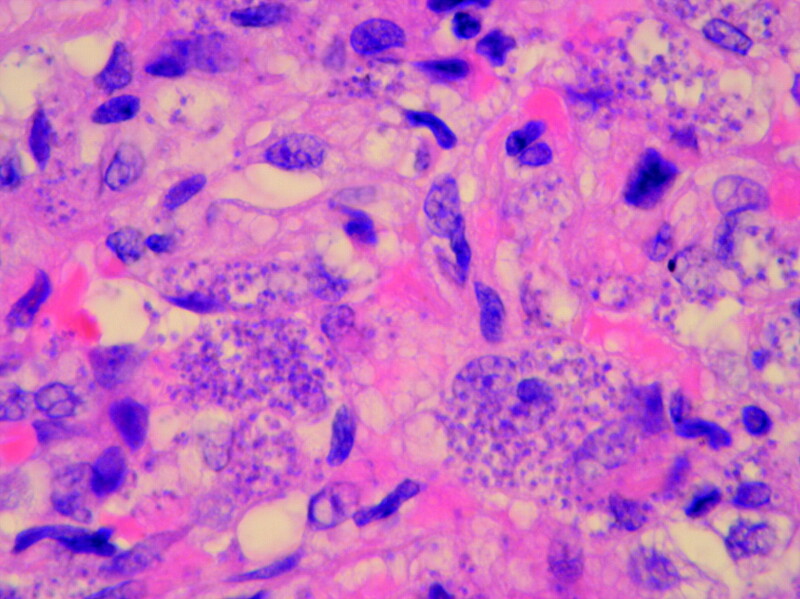 The mononuclear cells were heavily parasitised with Leishmania amastigotes (figs 1 and 2). No granulomas were seen. Leishmania spp. were also identified in a parotid aspirate (Supplementary fig 4). Stains and cultures were negative for bacteria, fungi, mycobacteria, Pneumocystis jirovecii and cytomegalovirus.
. Leishmaniasis. Postgrad Med J 2006;82:649–57.
. Leishmania in discarded syringes from intravenous drug users. Lancet 2002;359:1124–5.
. Clinical profile of Kala-azar in adults: as seen in Mymensingh Medical College Hospital, Mymensingh, Bangladesh. Mymensingh Med J 2003;12:41–4.
. The relationship between leishmaniasis and AIDS: the second 10 years. Clin Microbiol Rev 2008;21:334–59. Pulmonary complications of human immunodeficiency virus infection.In:Mason R J, Broaddus V C, Murray J F, et al., eds. Murray and Nadel’s textbook of respiratory medicine. 4th edn. Philadelphia, PA: Elsevier Saunders, 2005:2111–62. BMJ Publishing Group Ltd and British Thoracic Society. All rights reserved.